Mom's three sons, Walt, Larry and Igner, are remarkable by their devotion to their own mother and her business methods. They are the primary henchmen of Mom's business, and they are often sent out on dubious missions. Despite their somewhat comical characteristics, they seem to be quite successful in their tasks, such as stealing Fry's money, even though their scheme was dubious to begin with. Of course, this may also be attributed to Fry's own stupidity. While fascinated by their mother, she is not above physically abusing them, usually by slapping. Something they understand as a lesson, and do not protest. Of the three, Walt is the leader type, and occasionally slaps the others, and can deal orders out that their mother gives them. Larry is the shy and slightly scared one, who tries to avoid confrontation from Mom by even thanking her for her abuse. The last, Igner, is the stupidest of the three, who is often used by the trio to perform the less appealing tasks. Despite their obvious love for their mother, they were not in favour of her attempt to overthrow humanity, and as a result planned a mission to get Professor Farnsworth back together with Mom. While their age is never established directly on the show, events in Bender's Game seem to indicate that they are between 35 and 40 years old. While telling of his third return to work for Mom, Professor Farnsworth mentions it was "some 30-odd years ago" from a context perspective of 3008, and Nibbler says it was 36 years ago that Mom discovered where Dark Matter comes from. Since Igner is Farnsworth's son, and Walt and Larry have not been confirmed to be and are at least a couple of years older than Igner, it is obvious that they are not twins or triplets. They most likely were born within a couple of years of each other, as the older two are around the same stage of development in Farnsworth's flashback, while Igner had yet to be born. Larry takes the most slaps of the trio, while Igner takes the least. Igner was originally thought to be spelled as "Ignar". Igner is the half brother to Walt and Larry, due to his father being Professor Farnsworth. It is revealed that Farnsworth is Igner's father in Bender's Game during a parody of the fight between Luke Skywalker and Darth Vader, from Star Wars Episode V: The Empire Strikes Back. Igner's name could be a pun on the insult "ignoramus". Some of their behavior, especially their physical acts, is patterned after the Three Stooges. 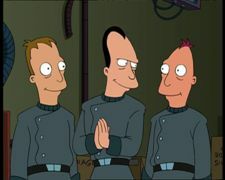 Had mustaches around the time of Bender's birth. Igner: Can I wear your fat suit? Mom: No Igner, put that down! Larry: Sorry, it's just so infectious. This page was last edited on 9 January 2017, at 08:25.